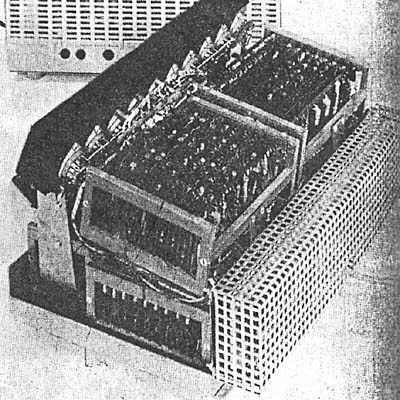 These three prototypes of electronic calculators were described in the March 1962 edition of the periodical 'Der Büromaschinen Mechaniker', shortly after the ANITA vacuum tube desktop calculators were launched. These machines were developed by Philips Gloeilampenfabrieken, Eindhoven, Netherlands to demonstrate the capabilities of semiconductor electronics. The details were provided by Valvo GmbH, Hamburg, Germany. There was no proposal to manufacture these models for sale. Indeed, it was pointed out that it could not be guaranteed that the circuits were free of patent protection by others. 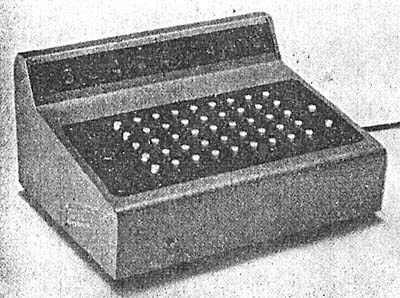 This high-speed adding machine was said to be designed to perform the same job as a Comptometer type mechanical machine, that is mainly addition. Like many of these machines it has a half-height keyboard with keys 1 to 5 in each of 9 columns, whereas the display makes use of 10 type 'Z 20 M' "Nixie" type tubes. 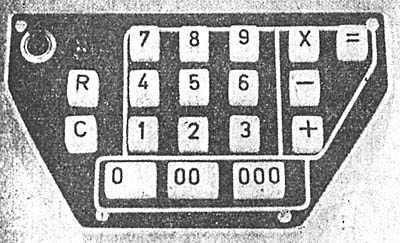 As can just about be made out in the photograph, the numerical display tubes are of the end viewing type rather than the side viewing type that were commonly used in calculators. It appears to have been capable of addition only. The electronics operates at 300 Hz and employs a magnetic core memory. 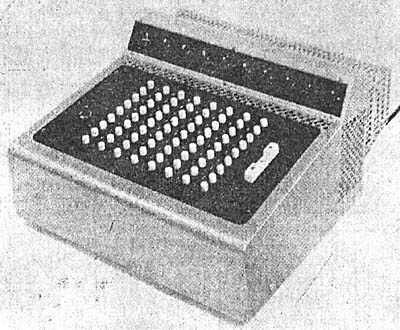 This machine has a full-keyboard comprising 9 columns of the numbers 1 to 9, and a 10-digit display for the digits and a +/- indicator. This is called a "Balancing" machine because it can be used for balancing a financial account, since it is capable of subtraction. This, it is stated, is performed using nine's-complement addition. Electronics: 142 transistors, 216 diodes, 704 resistors, 294 capacitors, magnetic core memory. Operates at a maximum counting rate of 10 kHz. This machine also uses the type 'Z 20 M' end-viewing numerical display tubes, which again can just about be made out in this photograph. Size: 560 x 610 x 305 mm [22" x 24" x 12"]. The calculator with the cover removed. This is looking from a rear corner and shows two rows of circuit boards - about 20 of them in total. Towards the top left are the rear of the sockets carrying the display tubes. Again, type 'Z 20 M' end-viewing tubes are used, pointing to the left. On the far left the edge of the wedge shaped keyboard can be just made out. A close up of this is shown below. Unlike the other machines, this one has a standard 10-key keyboard, but only has 'X', '-', and '+' keys, since it is not capable of performing division. However, division is possible by using reciprocal tables and then multiplying. Electronics: 293 transistors, 679 Diodes, 1328 resistors, and 632 capacitors, operating at 10 KHz. Size: 330 x 230 x 200 mm [13" x 9" x 7.9"]. The article with the information about these machines concludes by noting that since electronic calculators have recently been announced (i.e. the vacuum tube based Anita Mk VII) then these prototypes show the capabilities of semiconductors, of which Philips is a major producer. 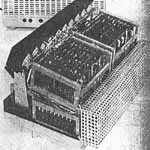 It notes that the production costs could be reduced by using many standardised circuit boards, and that there were no suitable small printing units then available if you wanted a listing of the calculations. "Versuchsmodelle elektronischer Tischrechenmaschinen", Der Büromaschinen Mechaniker, Mar 1962, pp43-46.